The Milton Goldberg Memorial Scholarship is awarded biennially to a string player for Suzuki teacher training. Dr. Milton Goldberg was born on April 21, 1920 in Toronto, Ontario. When he was a child, his family moved to Chicago so that he could get properly treated for polio. His “polio leg” did not prevent him from an active life as a conductor in the Winnetka Public Schools in Winnetka, Illinois, nor from riding a bicycle to go teach his classes on the grounds of Suzuki institutes. He grew up on the West Side of Chicago where his Russian/Lithuanian parents ran a general store. Often bedridden from surgery as a child, he spent much time listening to music, and it was only natural that he would become a musician. 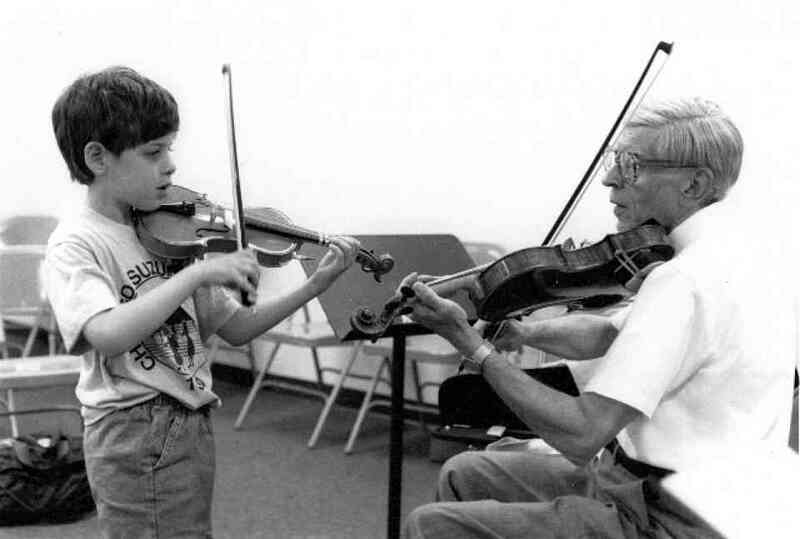 He began the violin at the age of 6 and continued playing and teaching until shortly before his death on June 1, 2002. In his youth, he not only played the violin, but also rode his bicycle as a delivery boy for restaurants in the area, one of which was a restaurant owned and run by the Diamond family. The eldest daughter Rhoda was a pianist and they became musical partners. Later while they were in college, their friendship deepened and they married in 1945. Their love affair lasted until Rhoda’s death in 1990. They had two daughters, Daryl and Sandra, who both became professional musicians. Daryl is a cellist who performs and teaches in the New York City area, and Sandra is a violinist and composer who plays in the Zürich Chamber Orchestra in Switzerland. Milton Goldberg studied with Henry Sopkin, George Dasch, Angel Reyes, and Samuel Thaviu, receiving his BMA from the American Conservatory of Music, and his MME and DM in Performance at Northwestern University. Not only did he play the violin, but also played the clarinet in the Farragut High School band. Besides giving violin lessons, his earliest employment was as band director at the same high school. 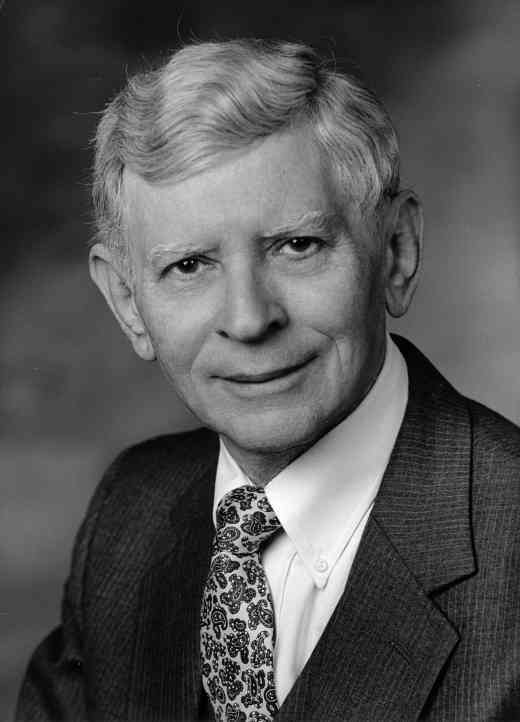 In 1945 he and Rhoda moved to Winnetka, Illinois, a suburb of Chicago, where he became coordinator of music at the Winnetka Public Schools, teaching and conducting at the three elementary schools and at the junior high school. During this time he pursued his Doctorate in music performance, which he received in 1970. He taught at the Winnetka public schools until he retired in 1978, continuing to teach at the Music Center of the North Shore and privately. He also played in various Chicago-area professional orchestras including the post as former concertmaster of the Highland Park Strings. Although he was not a religious man, his beautiful playing for the yearly High Holiday services of the traditional Kol Nidre and other solos with organ at the North Shore Congregation Israel Synagogue touched people’s hearts for many years. He stayed in artistic shape by giving recitals and chamber music concerts throughout his life and playing quartets with friends once a week. He was always rather peeved by people who would say “you play pretty well for a teacher.” One of his claims to fame was the virtuoso “Yankee Doodle” Variations by Vieuxtemps, in which his humor was displayed by the drawing of a long American flag stretched out behind his copies on the music stand. He was an excellent violinist, practiced Paganini caprices and the Kreisler cadenza to Tartini’s Devil’s Trill as a warm-up, and was always learning a new concerto or preparing new repertoire. In 1964 he heard the Suzuki tour students at Northwestern and then again at the MENC conference in Philadelphia. This inspired him to begin his own program in Winnetka after attending the first Suzuki institute in Alton, Illinois. 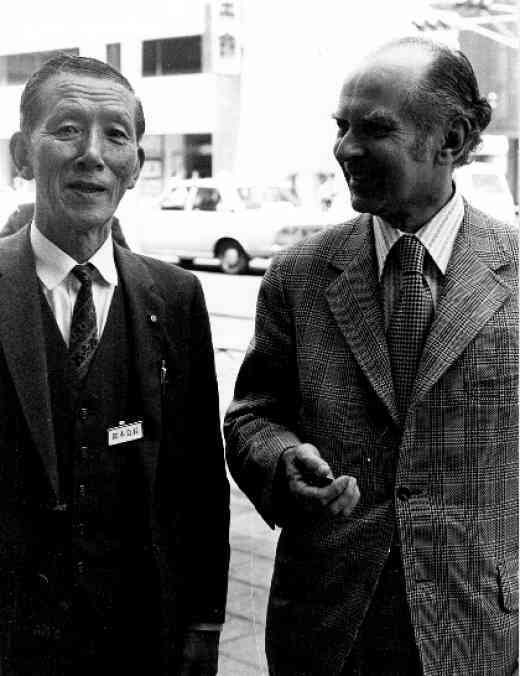 By 1970 he was recommended to Margery Aber as “one of the seven most outstanding Suzuki leaders in the United States.” He was invited to teach at Suzuki Institutes all over the country, including the American Suzuki Institute at Stevens Point, WI (holder of Distinguished Professor Suzuki Chair 1979), in Charlotte, NC, and in San Francisco. Other honors and positions he held were Suzuki Association of the Americas life member (awarded by John Kendall in 1981), SAA board of directors and treasurer, SAA Distinguished Service Award in 1992, violin editor for the SAA Journal, Winnetka “Educator of the Year” in 1980, Illinois ASTA Distinguished Service Award in 1995, and registered teacher trainer of Suzuki Violin Pedagogy. Former students of his have made successful careers in music, and many have become Suzuki teachers themselves.